Not a full running week, but the foot felt good and I really think my body is not meant to do regular back to back days. Lungs, sure. Legs, no, not yet. I’m OK with that. 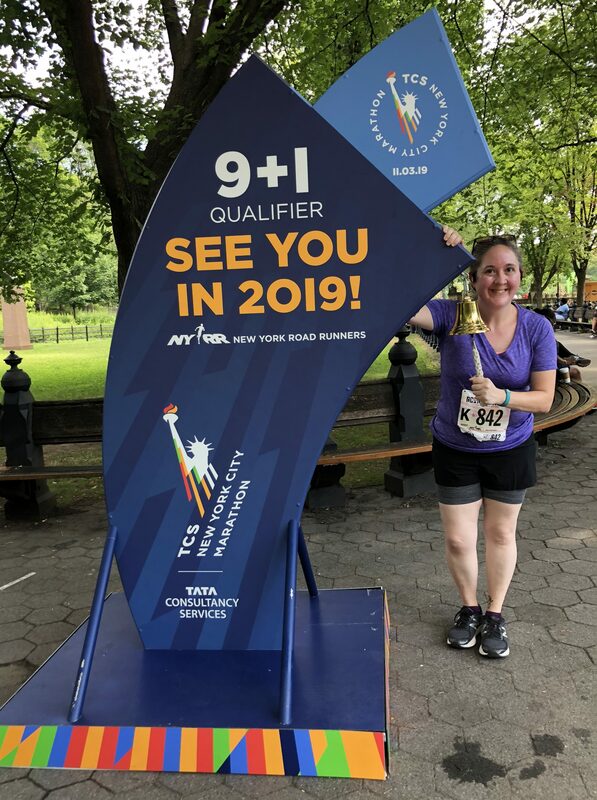 I really do need to find another long run before August’s Manhattan 7 Miler although I think speed work is the right thing for me right now not to over tax my foot. In the mean time, I set a rough goal for the Retro 4 Miler and was pleased to almost exactly nail it. Plus, it felt good to have a race again. Monday: oh what a Monday staring down a five day work week. I wanted to do some speed work, but also listen to my foot. I ended up doing a variation of this Friday‘s workout. Shorter, but nearly 20 seconds / minute faster as I went 5.5, 6.2, 5.5, 6.3 with .05 miles of 3.3 after each 6+ interval. The first 6.3 was for .3 miles and the second .28 as I closed out. Could I have gone to 3.5? Probably, but smarter not to push my foot, and the gym was disgustingly hot. This was a nice rebound after Saturday’s struggle, and it was good to see that a number of us struggled despite beautiful weather. What I realized as I was doing these quarter mile intervals, it’s essentially repeating a coupe weeks of C25K, but with the “walk” being a 5.5 mile jog. Whoa. Plus side of speed intervals being what they are, I show myself I can do a sub 10m mile even if I can’t (yet) sustain it. 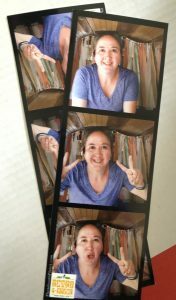 Tuesday: have I mentioned lately that I’m a bookworm? 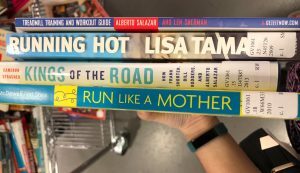 🙂 NYRR Run Center is hosting a book giveaway from the Runners’ World archives and I went to the preview when I went to pick up my bib/shirt for the Retro. I think I showed remarkable restraint, but I also know I’ll probably go back a couple three times. It was fun to see titles over time. I subsequently headed across town to the better air-conditioned gym for a 5K row followed by some planks. Intrigued by Running on Happy’s 5M plank challenge, maybe this fall. Wednesday: knew I couldn’t get to the gym after work and wanted to get something in so I planned on a run before work. Unfortunately my snooze button was all too close. I didn’t get out as early as I’d have liked, but it was better than nothing. To be honest, it was already so warm and humid, I’m not sure I’d have gone longer even if I had more time. Luckily I did have time to roll both of my feet before work since I found my original PF ball after I replaced it. The afternoon brought a follow-up appointment with the dermatologist. The mole biopsy was all clear and she doesn’t think it will scar. I care way more about the former than the latter. Thursday: week two for our office running group. Up to five this week and the experienced runner decided he was going to pace us. That was awesome, since I generally fail at consistency when outdoors. We did the entire lower loop, even if my watch didn’t. Since my foot felt good and I wanted more mileage I did some intervals at the gym before a really good, long stretch. 5.5, 6.2, 5.5, 6.4, 5.5, 6.3 with 7.0 at the final tenth to close out. The walk breaks after each speed interval were down to .05 miles. I was really shocked at being able to sustain 6.4 over a quarter of a mile. Knock wood, speed training is going well and I think maybe just maybe I’ll break 32m at the end of July. 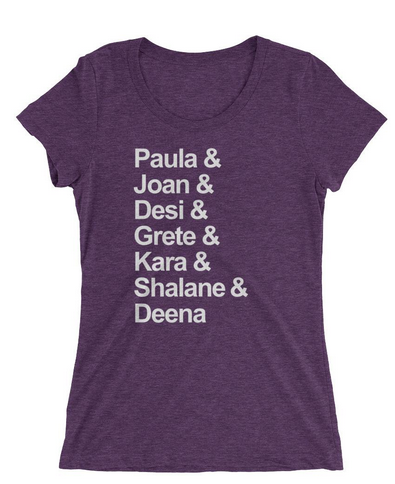 I was home catching up on some reading and I saw Ali on the Run’s post about the Sarah Marie Design Studio shirt, which I’ve loved since I saw Mary Wittenberg wear it for a panel. 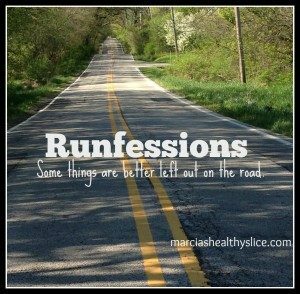 I still have no idea if I want to run a marathon ever (more on that later! ), but I love the dominance of women in the sport, and a soft, purple t-shirt? Winning. I’ve purged a lot of tee shirts, and I still have too many, but I love this for post-run relaxation. Friday: knee a little sore, so what was going to be a cross training day turned into a day off ahead of Saturday’s race. It’s not an injury, or rather not a new injury but an old injury that occasionally says hi and reminds me not to push it. So I listen. Rather than going to the gym I went back up to NYRR to have them do the fancy lacing that I can never quite get right and of course hit up the book giveaway one more time. Not much left by then. After a quick and fruitless shopping trip to try and buy some new shorts, I walked over the Brooklyn Bridge (rest day wasn’t going to be a step fail) and settled in with a good book or three. We’re not going to talk about that milkshake. Delicious, tracked and moved on. Just before sunset I hopped on the ferry for some gorgeous views. Walking the bridge was partially steps, but there’s also just no easy way between boroughs sometimes. Not taking a train on a gorgeous summer day? Winning. Saturday: race day! I truly mean the exclamation point for the first time in a while. Part of the issue I was struggling with in June was straight up tiredness. I was dreading the early wake ups (love how Cuckoolemon put it re: purchasing wake up calls!) and that was part of what made me not excited about weekend after weekend of race. Being sick didn’t help. But with two weekends off racing, I was ready for and excited by the Retro, in part because I did and loved it last year. Really interesting to go back and read some of that. Especially the post-race gimpy walk home which turned out to be the start of my PF battle. Oh how I hope this year’s marked the end. The first race in Central Park since it closed to cars featured an awesome pace car which I got a great view of as I ran to the start. While I do not like the staggered start at the foot of Cat Hill, I love the easy run to the start as a warm up. I was running late so I only had about 10M before the start, which was fine. I’m also kind of over the “turn and high five your neighbor” forced nonsense, especially pre coffee. Not as many super crazy costumes as last year, although I saw more toward the end. I really wanted to wear my School House Rock t-shirt like I did the tootsie roll pop last year (whoa, the weight I’ve lost in my face!) but it was just too gross to contemplate cotton. Cat Hill was a surprising non event. I don’t even remember any feelings running up it, and I was glad to hit the first sprinkler and water stop at the top. Although it was only mid 70s, the humidity was about the same. Oddly it felt like 102nd St. Transverse took forever to come and as a result of mile two not having any hills or water stops, it was my best. Come the water break on the transverse, I not only walked I stopped to get two cups. The first of the West Side up hills was bad, but then I settled into a weather-appropriate pace and just went. Overall it was a fairly steady race. Strava doesn’t show it because of its rounding, but it was .1 over for me (and many per IG photos) due to the angles in the park, but it seemed like a large number of people were complaining about this. It’s a 4M, not a Boston Qualifier, I think a little chillax is in order. My goal was to come in between the Gridiron (43:08) and Achilles (47:23) and ideally around 45m. By my watch/RunKeeper, 4.10/44:49 for 10:56. By NYRR, 44:47 for 11:12. BAM! Still using Runkeeper since that’s where everything is, but I’m happy. Gridiron was in perfect conditions, and I was sick for Achilles. Mile two showed the effects of the recent speed work and this fall I will do hill work, I swear. I have absolutely no idea if I want to train for a marathon, but I have until January to decide if I want to claim my guaranteed entry. I’m leaning yes: it’s New York, it will be the eve of my 40th birthday, but I’m just not sure if I have marathon training in me. I’m glad to have 9+1 settled so relatively early in the year so I have time to think on it. It’s crazy to realize that I’ve run nine NYRR races; one NYCRuns, one charity, and two out of town races. 13 races in slightly more than half a year, wow. And yes, running in shorts. I actually haven’t worn capris since Achilles. I know, what took me so long. Rest of day was good, if lazy. 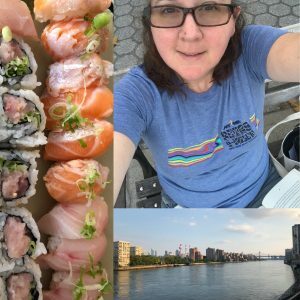 Took myself out for sushi and then sat by the East RIver to finish one book and start another. And my cotton tee shirt tradition of wearing it post-race. 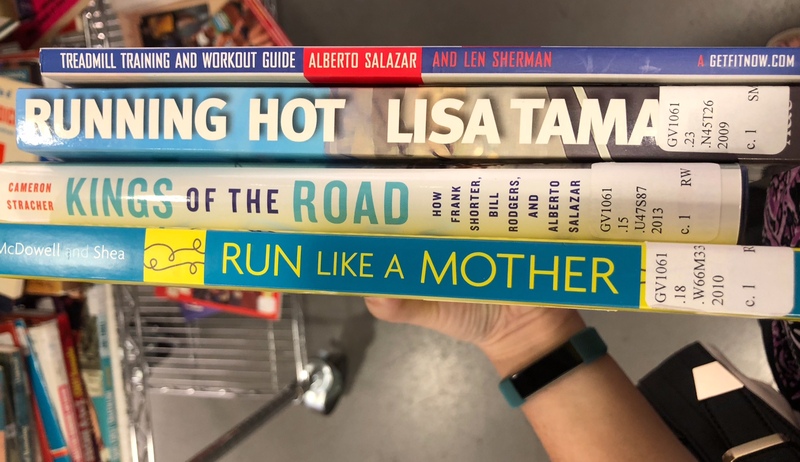 None of these is #20BooksOfSummer or the NYRR finds, but my annual permission between Memorial and Labor Day to read fluff. This seems to be the year, or at least the week, of catching up on James Patterson. And new Gabriel Allon comes out Tuesday, can’t wait! All in all, a good week and one that I’m happy with. Taking today off although I may go to the gym to stretch when done with a work event. Plan for the week: run Monday, Thursday, Friday or possibly Monday, Wednesday, Thursday depending on Wednesday work event. No races next weekend. A great week, I love seeing you get stronger and more and more confident! I also love that tshirt with all the names on. I only generally do plain ones but that’s cool. And the BOOKS! Hooray! I’ve been running in shorts, even me, and finding them very comfy, actually, and no one has fainted or had me arrested! For general wear I’m plain or patterned shirts, never really been a words person outside my sports teams, but something in running unearthed a love of them. I’ll have this, my two cotton retro ones, “She believed she could, so she did” from the FLL Expo, and an Old Navy Women’s Day one. OK not really running on the latter, but running enabled me to fit into Old Navy so kind of connected. I thought I’d be way worse with the books, but this was less Runners’ World titles and more NYRR Library clean out. Free was good, but there are only so many training books you need. Fun to leaf through some old ones. Way fewer pages on gear. If you want any of these, let me know and i’ll save for you. I think I’m so ecstatic that these don’t ride or chafe. I could never do standard running shorts. They’re just too short for my comfort. As someone who keeps throwing her name into the NYC Marathon lottery but doesn’t get chosen…go for it! I was one of Sarah Marie’s original ambassadors. I have quite a few of those great tops with cute sayings! I wish I could still get a discount. 😉 Great job on the race. It looks like you nailed your time goal! Thanks for linking. I entered this year, but knew I wasn’t ready so I was glad not to get chosen. The plan all along was to do 9+1, but some part of me couldn’t believe I’d ever do 9 runs in only my second year of running, let alone the first half. I didn’t look if Ali’s code is good on all products but it might be, as she posted it for the tank and I tried it for the shirt and it worked. Gone for a Run has some of my favorite running tees, but I’m glad they also sell through Amazon as their shipping is otherwise a killer. Sarah Marie is new to me, but look forward to exploring more of her stuff. Looks like you had a solid week! Yay for clean mole biopsy-those are no fun at all. I am trying to be better w sunscreen myself. Yes, I need to be better about wearing it all the time. I got burned the other day for my own stupidity. Found a moisturizer I like with SPF30m which helps. I bet it would be interesting to see how the books changed over time! Congrats on your race time. And hitting 9 + 1 . I bet you could find a training plan to get you to the finish line smiling. 🙂 It would be an awesome way to head into your 40s. I think I’d probably do what I did for my Half; adapt Hal Higdon. I’m just not sure the degree of adaptability there is in full plans, so I have some reading up to do. Thank you! Sounds like a really good week! Very happy the mole was negative (sure you were too, LOL). Great job on your race! The speedwork is paying off! Especially in summer heat. Yes, the milestone is the draw. I quite love the Half, but cannot fathom running any longer. But I look back to my first 10K when I couldn’t dream of doing a second lap of Central Park, yet I’ve done exactly that. So maybe I can. It’s definitely food for thought. Never seen an 18 mile run – that would be a fun intermediate. and thank you, so relieved on mole. I’m glad you had such a strong week and congratulations on your race! I hear such amazing things about the NYC marathon, at least you have time to decide whether you want to sign up for next year! I’ve been relying on Amazon for my reading material lately but I hope to branch out. 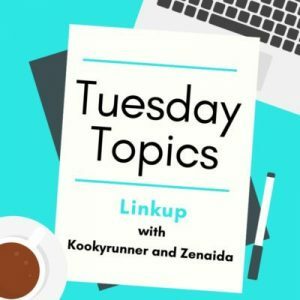 I feel like I’m due for some fluffier reads…I tend to be drawn to thrillers and dystopian societies, lol, and it’s a little tough to recover! Thank you! 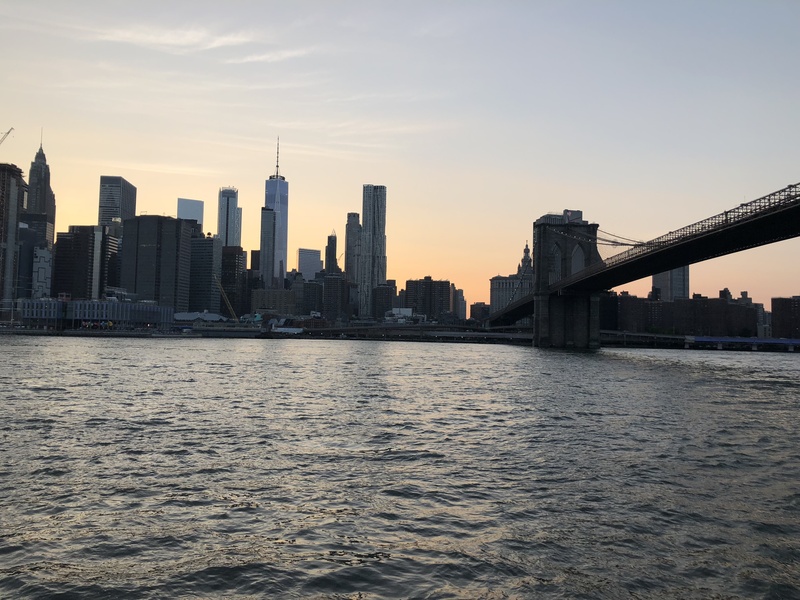 As it’s home, I’m biased but I really do think NYC is a magical course. Yeah, I can’t do the dystopian as much as I’d like exactly for that recovery. And thrillers are banned after dark after giving myself one too many nightmares from them. They’re just so good though! Congrats on your NYCM qualifier! You’ve been working so hard–you should do it! That NYRR book giveaway sounds awesome. I bet it was fun to see the books over time. I do almost all my reading on my iPad now. Old age and all, I like the bright background and the big text! Thanks! Leaning yes, but definitely want to think on it. I do the bulk of mine on the Kindle as well, and have actually passed on cheap print titles because the font is just too small. But for some reason, NYPL doesn’t have the best selection of mysteries (or running titles) and I can’t resist the lure of free or super cheap. Some of the old titles though are just way too small and close together. My first mole biopsy was in college, and I was totally freaking out. now it’s a way of life since I’m so fair. My doctor always wants to be safe. I don’t really care about scarring either since they’re so small to begin with. That is so exiting you have an in for NYC. You should definitely do it! I need to start reading more. I like the idea but when it comes down to it, I never do it. Yes, I love that they do this to recognize the local runners who spend a lot of time/money with NYRR throughout the year. When you total up nine races it ends up more expensive than just the lottery fee but way cheaper than a charity bib so win win. Congrats on 9+1! Having waited in the lottery for 4 years before getting to run NYCM I’d say go for it. What a great way to celebrate turning 40! “Unfortunately my snooze button was all too close” – this describes me to a tee! I just bought some PJs over the weekend which have “Just 5 More Minutes” printed on the front! Oh my. I need those PJs as that’s also me all the time. Especially if I’m sleeping in AC as I was that night.